Living with her widowed mother, brother Percy (age 19), and brother Robert (age 36). The city directory reports Mrs. Mitchell (sic) Fauria, Cecelia Fauria (clerk), Percy Fauria (bookkeeper), and Robert Fauria (Fauria Bros and M Fauria & Sons) at this address. She is living with her widowed mother and brother Robert in 1930. She died at home, 3226 Calhoun Street, New Orleans, Louisiana. Her death certificate was witnessed by her brother, Fred V. Fauria. [S25] Census-US federal-1900, (Ancestry.com. 1900 U.S. Federal Census [database on-line]. Provo, UT: MyFamily.com, Inc., 2004. T623, 1854 rolls. ), Louisiana, Orleans Parish, New Orleans; Roll: T623_572; Page 3B; ED 50 (Reliability: 1). [S71] Genie: Faustina, Steve [FAURIA], (Son of Lillian Fauria  and -- Faustina; grandson of Virgil Michel Fauria  (1898-1982) and Inez M. Rebert  (1898-1974). Email address: sfaustina@hotmail.com), email, Steve Faustina to Gladys Sims 10/26/2002 (Reliability: 1). [S45] New Orleans Death Records Index 1804-1949, Ancestry.com, (Provo, UT: MyFamily.com, Inc., 2002. ), No Volume or page given in Ancestry.com listing (Reliability: 1). [S223] Death Certificate, Cecilia J. FAURIA (d 23 Dec 1947), Louisiana Vital Records, Vol 223, page 7191 (Reliability: 3). [S18] US-Louisiana-Orleans Parish-New Orleans Birth Records Index 1790-1899, (Ancestry.com Provo, UT, USA: The Generations Network, Inc., 2002. Original data: State of Louisiana, Secretary of State, Division of Archives, Records Management, and History. Vital Records Indices. Baton Rouge, LA. ), Vol 96, Page 904 (Reliability: 1). [S27] Census-US federal-1910 (ancestry), National Archives and Records Administration, (Ancestry.com [database and images on line]), Louisiana, Orleans, New Orleans, Ward 5; Series T624; Roll 521; Page 136B; ED 77 (Reliability: 1). [S28] Census-US federal-1920, Ancestry.com, (Provo, UT, USA: The Generations Network, Inc., 2005. ), Louisiana, Orleans, New Orleans; T625_621; Page 3B; ED: 115; Image: 207 (Reliability: 1). [S388] US City Directories (ancestry.com), Ancestry.com, (\i Ancestry.com\i0 . http://www.ancestry.com : n.d.), FAURIA, Cecelia. Soard's, New Orleans, Louisiana, 1923: page 602 (image 307); <http://www.ancestry.com : accessed 12 Nov 2014 (Reliability: 1). [S83] US-Louisiana State Death Certificates, FAURIA, Cecile Cagnolette - 2 Mar 1938 - Vol 209, Pg 2639 (Reliability: 1). 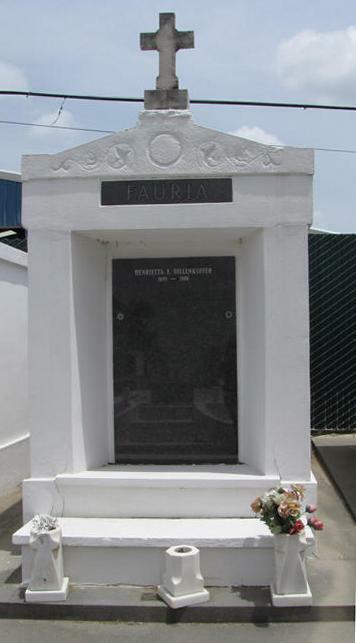 [S334] US-Louisiana-Orleans Parish-New Orleans-St. Louis Cemetery #3 Fauria Tomb ownership records, Saint Louis #3, Fauria, Cecelia J. Burial 24 Dec 1947, Position V2. (Reliability: 3).